Working the NIH part 3: Where is My Grant? 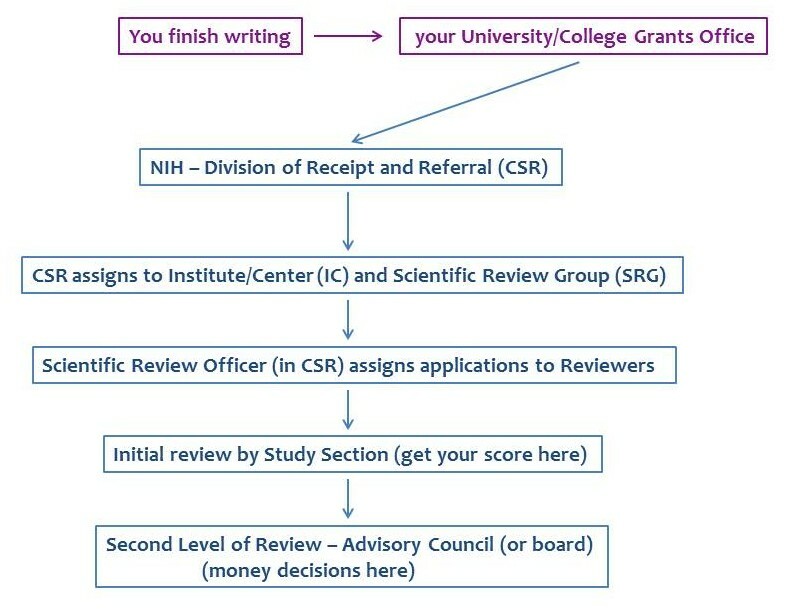 Here is a flow chart of what happens to your grant. In terms of YOUR energy, it is obviously front loaded. But knowing what steps happen after it goes off into the big unknown important to what you write in those beginning steps. When you submit your grant it goes to what used to be a big room in Bethesda, and now is a virtual big room n Bethesda. At this point there is bifurcation (only alluded to in previous posts). If it is an R01, R21 or some of the other mechanisms, it goes to Center for Scientific Research, gets assigned to a CSR study section for the first step of the review. All IC’s (or close enough for government work) fund R01s, and they go to CSR standing study sections. The ones that tend to fall in this latter group are R03, R15 (or AREA grant), T(institutional raninging proposal), a F (fellowship) or a K (Kirschstein training award) (more about training awards here). If it is one of these mechanisms, the proposal may be assigned to a specialized study sections/ review groups whose membership is determined by the IC not the CSR (the IC review group mentioned above). This process is largely invisible to the applicant. You may not even notice until you get info about the assignment of your grant (oye, another post – on eRA commons – the NIH grant submission/reviewing/etc web site). This however, is not the recommended way to go about things. Not all IC’s support and fund these other mechanisms. And, how the IC’s implement them also varies. For example, R03’s, the small grant mechanism, is only funded by some IC’s. Here is the link to determine which for R03. But different IC’s fund R03s at different levels and have different eligibility. The review forms and criteria for these grants differ from standard R01’s, but they are consistent across IC’s. Again, there is nothing special you need to do for this. Why does this matter? Because you MUST to pick an IC when you submit it. Again, not all IC’s take R03’s. Some take R03’s only from new investigators. Some only give 50K a year. Some only do it for very specific areas of interest within the IC. You can find out this info in two ways: 1) on the grants page for each IC, or 2) on the NIH web page about the mechanism. Here is the link for R03 R15s. for T-awards (which are institutional – if you don’t know what they are you’re not likely to be applying for one), the F-awards, here is for F32s and for the numerous K-awards. I will blog more about the F’s and K’s very soon. I sat on a study section for training, R03, etc for one of the smaller institutes for too many years. It was the only one for that IC, and if you wrote a training grant or R03, I saw it. Yet, I felt that the study section operated just like any of the grownup CSR ones I had dealt with or sat on. You will get as fair a deal from one of these as you would (and perhaps more so) than from a regular, standing study section. Thanks for this. There isn’t anything in the R03 or R15 parent announcements that indicates that review is through the I/C, rather than CSR. The grant goes to the CSR, and then is delegated to the special study sections. If you go to the IC web page, and look at their grants, often you will find it there. Or follow the links from the “who does this mechanism” page to the IC page, you might find it there. Sometimes you don’t know till the review happens and you get the link to the study section through Commons. Clear as mud?